Do you worry about how your children will cope when they leave home to go to university? As a parent of a very young child, it’s not something I’ve got to worry about for a long time. However, I’ve recently thought about it, and the concept scares me. 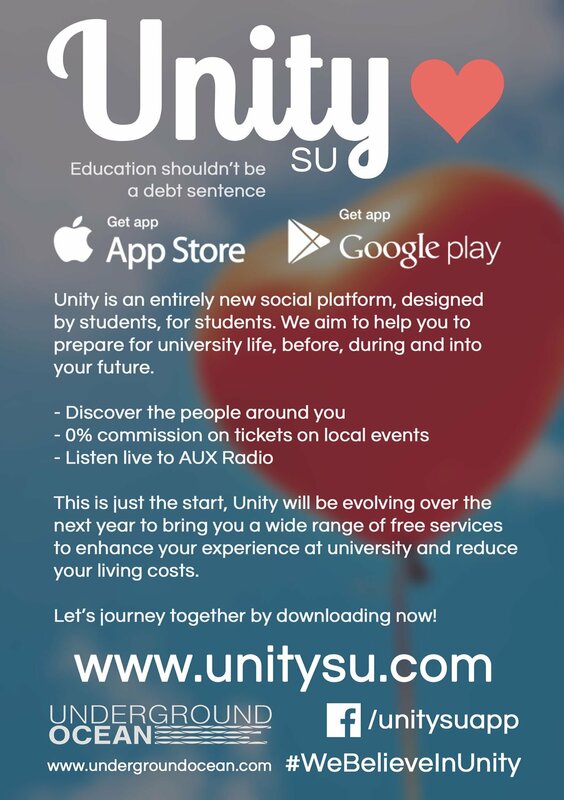 Unity SU is a new social media app dedicated to students and university life. Often leaving home for the first time is a scary thought, the idea of living alone, taking care of finances, making new friends and just generally a new chapter of their life! Unity SU’s aim is to help with all of this, and have done so by building an app and a website. Karl Jennings, Co-Founder of Unity SU (who happens to be my brother) has spoken to me quite a few times about this, and we decided to put an interview together to explain how they can help! My friend and Co-Founder, Justin Ranson, was expressing his concern about the student riots to me at the end of 2012, and we both instantly agreed that student debt was out of control and needed addressing. Having both had backgrounds in tech businesses, building an app seemed like the right way to go. We instantly began to build a team of the right people to do this. So you had the idea, where did you go from there? We spent several years collecting information and feedback from students across the country to see exactly what they needed and wanted. But something had to be different. Everything up to this point takes from students, whether it be a few pounds here or there, which may not seem like much at the time, but it all adds up. We decided to do something revolutionary and wanted to give back to them. We developed a business model that turns the system on it’s head, taking the money that normally goes into corporate pockets, and gives it back to the students. Sounds great! How did you do it? Basically, advertisers and businesses love students. Whilst researching, we discovered the vast amount of money businesses spend reaching out to potential customers, for one main reason. Once a brand loyalty is established, you tend to stick with it, and students are a prime example of this. This could range from the bank they choose, the beer they drink and the places they go. We spent several years perfecting an advertising model, allowing businesses to advertise directly to students at an unrivalled low cost. We then decided to do something that absolutely nobody else would think of doing. We decided to take 70% of those revenues and share them amongst the students. Tell me another business that does that? 70% to the students, that’s a lot, so what’s in it for you? Yes, 70% sounds like a lot, but that’s because businesses generally are greedy, so that’s what you’re used to. The originality of our business model allows us to share revenues with active users of the app daily, every day. So, the more students download and use the app, the more we share. 30% is more than enough to run our business successfully. We don’t need any more than that. It’s nice to finally see a business that aren’t in it just for the money. Can you tell me more about what the students can expect from Unity SU? Find the people around you in geolocation order, chat with them, follow them, show your interest in them if they catch your eye and bring the university community and neighbouring universities closer together. Let others know where you intend to attend university and meet up with others in your home town who have the same intentions, allowing you to make friends far before fresher’s. Enable students to offer help on their chosen course to other students and create an income for providing this tutoring service. Find accommodation, rate your accommodation and landlord and as a community, help raise the standards of student accommodation. Rate your university based on a wide range of criteria and as a community, help raise educational and institutional standards. Find all the events happening around you and purchase tickets for them with 0% commission. Keep all your event schedules on an easy to use calendar so you never have to double book yourself, or miss anything. Find jobs in your local area and nationally and easily put potential employers in direct contact with students. Set up intramural sports teams and create your own leagues, allowing those who don’t play for official University teams to immerse themselves in Unity managed sports pursuits on a local, or inter-university basis. Listen to AUX student’s radio wherever you are and interact with them, make requests and enter into live debates on content matter. We’re constantly working with students to innovate new ideas to add to this. I like the motto “Education shouldn’t be a debt sentence” that seems to be popping up all over social media at the moment, what does it mean to you? I love the thought of giving back to those who need it, and I feel our motto sums this up perfectly. It’s not just the case for university students, it’s the case for everybody. Education should be a right and not a privilege, students shouldn’t have to put themselves in financial worry to better themselves. I’m sure all parents and students will agree with me, and if you don’t, you will find yourself very much alone. Giving back financially to the students is only the very start, and the exposure of our ideology to the masses is sure to bring a change that we cannot bring alone. Working as a community and a team is far stronger, we will be able to bring greater changes that nobody thought would ever be possible. And finally, how can everyone get involved? The main thing is if you’re a student, download and use the app. Every time a student downloads and uses the app, they’re helping themselves and each other. We also need everybody possible to embrace and spread the word on what we are trying to achieve. The easiest way to do this is through our social media. Together as a community we can do this! You can download the app on IOS and Android. Visit unitysu.com/ for the links. So there we have it! When Karl originally told me about this I was impressed, but after going into detail I know it’s definitely something I am going to support, for an easier education for my child, and every other student out there.